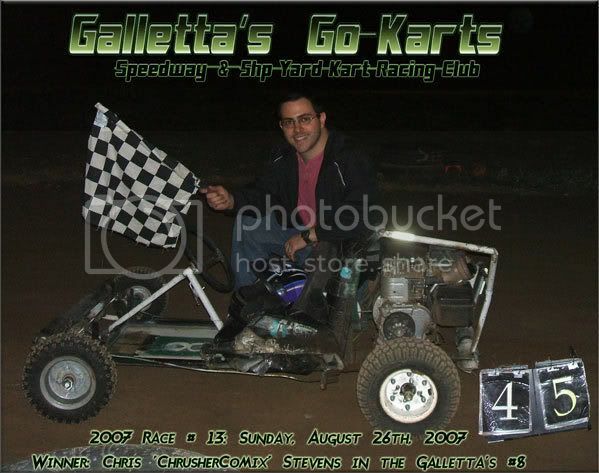 On August 26th, 2007, Chris "ChrusherComix" Stevens wins his 2nd feature of the year in his Galletta's #8, a 45-lap, 12-kart event. But the motor has won 2 straight races, as last week Kyle Reuter won with it on the Galletta's #5! 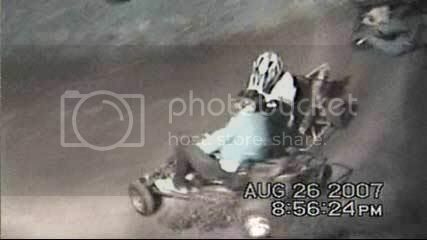 Chris thanks his brother Matt and Melissa Gabel for their diligent work on the track and karts during the week. "The track held up for me this week. The last two, a pothole in turn three was my worst enemy as Matt and Kyle each got me back there while leading two weeks straight!" he said. 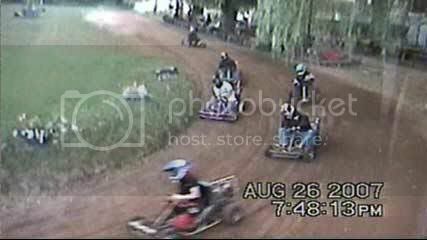 Contains the August 26th, 2007 races at Galletta's, and as a bonus, one of the two camera angles from the August 30th, 2007 races from Oswego Speedway Yard Kart Classic. 1 hour & 56 minutes! Ken Lindsley Jr. held off a charging Chris Stevens for the 2nd Heat win after Chris' left front tire popped brushing against Kenny. Ken was followed by Mike Howell, Brian Bortel, and Melissa Gabel. 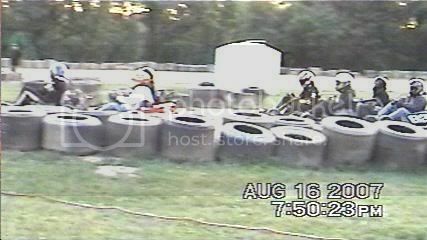 Chris and Ryan Coleman didn't finish the race, but were repaired for the feature. Oddly enough, this video is our most-watched and most lambasted video on YouTube, despite the fact that it isn't even close to our best video (it's just a compressed and edited wreck clip). It's odd how many people hate this video and let us know about it with harsh criticism aimed at me. I suppose that's a good thing - our worst wreck ever recorded on tape was actually not that bad looking (although it does look worse uncompressed - the YouTube quality does it no justice), and apparently this offends people (mostly total strangers) to the point of angry retorts towards us. Go figure. People are generally good, aren't they? An extremely scary accident took place early on when Wesley Ogre Stevens, Kyle, Matt, and Chris were battling in the middle of the field, side-by-side, 2-rows-deep. 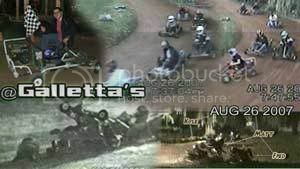 When Ogre and Kyle brushed wheels down the front stretch, it sent Kyle into Matt and then they both crashed extremely hard into Fred Collins, who had retired and nonsensically parked in the interior grass just barely off of the track. 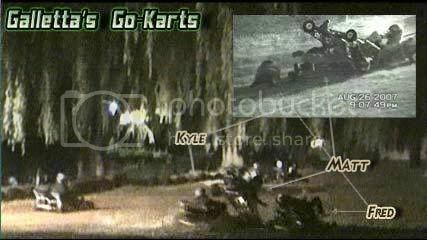 The crash was horrific, as Matt, Kyle and Fred all flipped over each other, but wouldn't have even been a footnote if someone wasn't parked in the interior of the track. This action is forbidden. 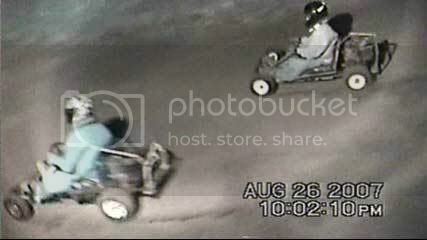 A retired kart must park in the garage area, deep in the middle of the track, or the caution must come out. 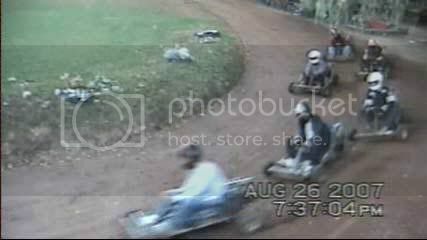 Luckily, thank God, they were all OK other than some bumps, scrapes and bruises. Don't forget to check out the new 2002-2007 Win List! 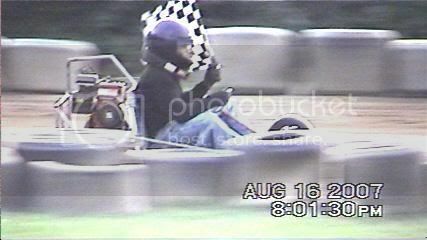 On August 16th, 2007, members of the Galletta's Go-Karts Club raced in Oswego Speedway's Dirt Oval in the Super Yard Kart division. Kyle Reuter won the heat after a few drivers thought the caution was out and he went from 5th to 1st. The Feature was won by Matt Stevens in the Galletta's #33, and he was followed by Mike "MC" Howell in the Galletta's #6, Joe Hayden in the OHV #5, Eric Raponi in the OHV #83, Kenny Lindsey in the Galletta's #2, and Kyle Reuter in the Galletta's #0 after he dropped out while running 3rd. Shadof Russell was black-flagged and finished last in the Galletta's #7. Website designed and maintained by Chris ChrusherComix, and not necessarily anybody else's at Galletta's.